Do you trust your human self with an accurate measurement from a measuring tape? Someone is about to cut something based on your knowledge of measuring things and will you succeed? Bah, lets go with technological superiority for simple tasks like this with this cool new General Tools 2-in-1 Laser Tape Measure. 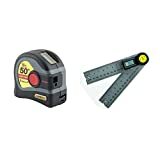 This innovative measuring tape combines both a traditional 16 ft measuring tape and a 50 ft laser measurer in one for both short- and long-span accurate measurements. No matter whether or not you can read a measuring tape or not, this high tech, precision tape will deliver an accurate measurement for a long or short distance on an LCD screen. Best of all, no one will need to hold the end of the tape for you and no snapping tape blade rewinding is required. Large, clear LCD screen for quick readings.